New Jersey Golden Gloves is a non-profit organization that promotes amateur boxing, runs local tournaments and sends a team of the state’s best boxers to the Golden Gloves of America’s national tournament each year. This year, more than 200 young boxers are competing in the New Jersey Golden Gloves which features nine preliminary bouts throughout the Garden State including the bout on Sat, Mar. 24 at the Washington School in Union City. Members of the Union City Boxing Club’s team will be competing along with young boxers from other local gyms including the Bayonne PAL and the Ringside Boxing Club of Jersey City. Preliminary winners will advance to the state finals held at the Prudential Center in Newark on April 7th. Boxing Coach and head trainer of the Middletown PAL Dan Doyle of Long Branch is President of the New Jersey Golden Gloves. When he took on the state leadership in June, Doyle recruited a new board of directors which initiated a scholarship program for the state’s most promising athletes. Many of the competing boxers are young people from areas around the state that have been hardest hit by cuts to community programs, Doyle says. Boxing clubs like the Bayonne PAL, Ringside Boxing Club of Jersey City and the Union City Boxing Club all provide a training program that keeps young men and women, boys and girls focused on a positive goal while offering a safe environment. And taking some punches is all part of the sport, Aviles says. 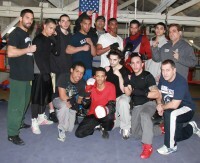 The Union City Boxing Club is all volunteer-run; Botti volunteers his time and so do the other trainers. Mayor Brian Stack of Union City donates the space and Union City and the Union City Boxing Club are co-sponsoring the Golden Gloves preliminary event on Mar. 24th at the Washington School and footing the bill for the boxers’ uniforms, equipment, and other bout expenses. The Hudson and Bergen County Electrician’s Union, Local 154 will be sponsoring the March 30th Golden Gloves preliminary bout in Paramus. Proceeds from the ticket sales will go to breast cancer research says Paul Dunleavy of Jersey City, a former boxer who has volunteered his time raising money for the Make a Wish Foundation and is now lending a hand to bring awareness to the breast cancer. The Union City Boxing Club is filled to capacity now, young boxers sparring in the ring, hitting heavy bags and speed bags, jumping rope, doing sit ups. Botti says that in the summer, 40-60 boxers-in-training come each day. And there is no age limit; they’re as old as 42 and as young as 8. At 11, Deandre “Dynamite D” Guzman is a four-time New Jersey State Champion and veteran of 36 fights. Deandre has traveled to Las Vegas, Ohio and Upstate New York to compete and the sixth grader says he likes being in the ring. “I want to be an Olympian,” Deandre says. Botti was about Deandre’s age when he first discovered a passion for boxing. Growing up in Union City, he founded a boxing group when he was young and, he says, it helped him get through tough times. And now, he’s paying it forward. Sat, Mar. 24, 7 p.m.
Fri, Mar. 30, 7 p.m. Contact: Cassie Wordelman at 201-265-7273, ext. 213, or Theresa Rolaf at 201-265-1700, ext. 4246 or visit www.ibew164.org for more information. Fri, April 6, 7 p.m.
ICAT Academy of Boxing, Fitness & Martial Arts, 1304 Brielle Ave., Ocean Township. Sat, April 7, 7 p.m.